On October 29, I did about a 40-minute interview on Skype with a team of producers from Malaysian TV in Kuala Lumpur. They produce a show called Strange Encounters, and they wanted to talk to me about aliens. They had recently traveled to Thailand, where they met with Dr. ThepPhanom Muangman, a U.S.-trained medical doctor who says he regularly communicates with aliens. (He says that his first UFO sighting occurred in New Hampshire when he was a medical student back in the 1950s - beating out even Betty Hill!) He has a considerable following, called the Kao Kala Group, named for the hill that they claim is a UFO hotspot or interdimensional portal or something. There was an article about him in the Wall Street Journal back in 2011. You might say that Dr. ThepPhanom is the Steven Greer of Thailand. They sent me links to two videos. The first one just seems to show a satellite going over, very likely the ISS. I told them that there was nothing unusual about that one. The second video, below, purports to show an "extraterrestrial" walking around farmers' fields in Thailand. Notice how dramatic music has been added. I pointed out to the producers that just because this guy is walking around in a white suit, that doesn't make him an alien. This looks like the kind of suit someone might wear when working with hazardous materials, perhaps putting pesticides on the fields. The second part of the video shows a bright light in the sky. It looks like it's possibly an airborne flare, on a parachute, but not knowing how it was recorded, it could be just about anything. In their imagination, they claim to see ETs jumping down from it. The Strange Encounters producers interviewed Dr. ThepPhanom at his home in Thailand. He talked about meditation and trance states for communicating with aliens. He fiddled with an electro-magnetic field meter, telling them that this device can detect when aliens are present. It quickly got a high reading, causing Dr. ThepPhanom to exclaim "they are here." Unfortunately, the aliens were invisible. 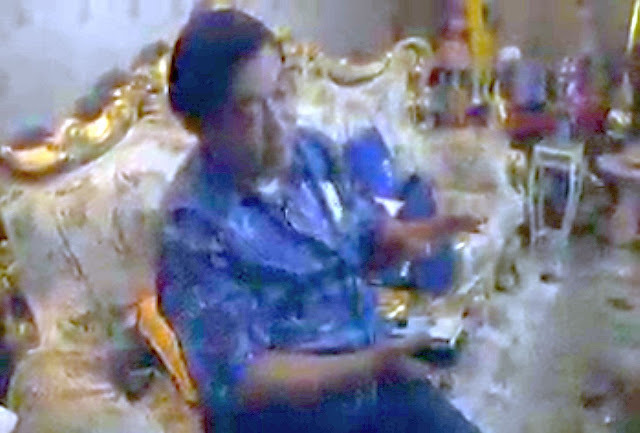 Dr. ThepPhanom detecting aliens using his EMF meter. As the interview went on, some of the Doctor's followers were out in the yard, and captured on video this object that allegedly made a single, high-speed pass over his house. 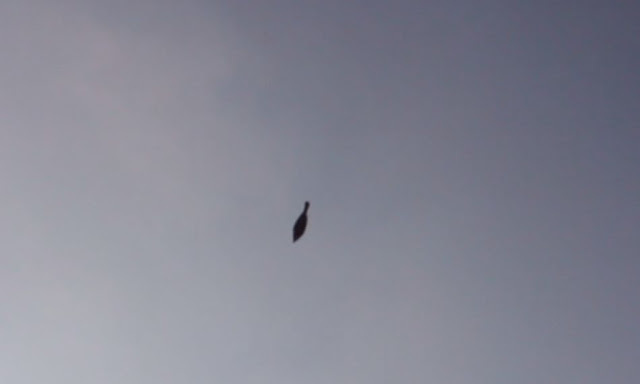 It looks like an object that somebody simply tossed into the air, for someone else to film. How did they know the precise time to turn on the camera? At first I thought it was a fly buzzing over - that's how fast it went - but when slowed down it clearly was not a bug. Coordination for Disasters Warning (the Kao Kala Group), is a group of people who receive information in order to coordinate with other groups, in case of disasters, to provide warning when we receive the information from extraterrestrials, in order to warn the people, preparation of equipment and technology in order to help, enhancement the state of mind of the people who work and acknowledge this project. Currently their Blog contains "messages from the chief of Pluto that were sent by sound wave channeling at Kaokala hill, Nakhon Sawan province, Thailand on March 6, 1999." All the postings use the Thai calendar, so I cannot say when they were made, although Blogspot shows postings in 2011, then nothing until 2015. As near as I can tell, there is no such thing as "skepticism" in Thailand when it comes to claims of UFOs and aliens. At precisely 01:28am 29 June 2015 on HWY 1 south heading north approximately 7-8 miles south of a gas station at 10525 HWY 1 south, Wadley, GA, 30477. Our radio began to get real static so I turned it down when my wife noticed a very large object flying left to right coming toward us. I looked up to the left and hit my brakes stopping our truck to the side of the road. The object appeared to be approximately 250 meters in length 60 meters height and was approximately flying 200 feet in altitude and was spurting sparks from the rear of the object. The sparks were jetting out about 50-80 meters in a pattern of controlling thrust. My wife and I had a very good look at the object closer than anyone else on that highway considering there was no vehicles in sight. The object had a dim glow of a orange around it, vague but noticeable. The objects exterior was metallic but appeared to look like oil on water effect to it and appeared to be fluid like movement over the metallic body of the object. My wife and I watched in disbelief in what we were witnessing as it moved left to right the object decreased in altitude as it was over the highway then began to increase in altitude after it crossed the highway right overhead of us. We watched as it increased in altitude and penetrated some clouds and accelerated out of sight through the cloud cover quickly. They do not say who did the drawing (presumably the witness), or wrote the symbols. But satellite orbit guru Ted Molczan thought that this sounded like it might be a possible satellite re-entry, and he went to work. He found that the time of the event matched almost perfectly with the known re-entry of 1973-084D / 6939, the final rocket stage of the launch of Cosmos 606. This event was widely witnessed, giving rise to 169 reports in the database of the American Meteor Society. A second rendering of the object, from the NUFORC, with symbols written across the bottom. The witness stated that the sighting was at "precisely 01:28 am." Based on the trajectory analysis, I doubt they would have spotted the re-entry much before 01:29:30 EDT, when it was near culmination, 34 deg above the NW horizon. I estimate that they would have lost sight of it about 01:30:30 EDT. The time discrepancy is not large. If the witness were to insist that 01:28 is correct, and claim that this proved the re-entry was not their UFO, then he would need to explain how he failed to see the re-entry when it passed a minute or two after the UFO, directly in front of him as he resumed his drive north. The satellite imagery, taken within minutes of the sighting, reveals that the sky was fairly clear. The reported sighting duration of 4-5 min is quite a bit longer than the 1 min. that I estimate the re-entry was in view, but the discrepancy is not unusual for events of this type. 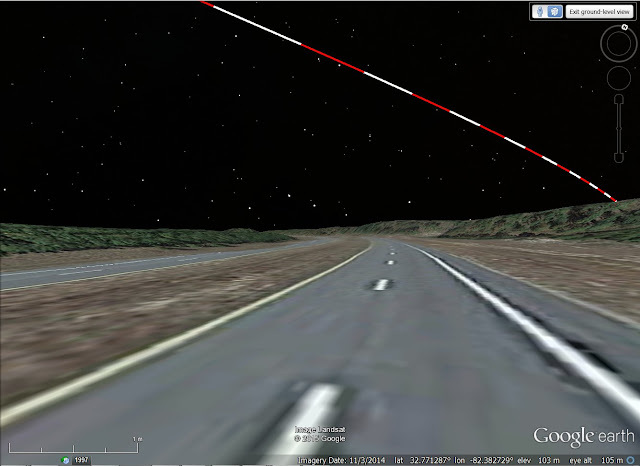 Molczan's reconstruction of the re-entry event, as the observers would have seen it in their truck. The NUFORC added Molczan's explanation to its listing of this incident. The witness, however, "states unambiguously that he believes that what he witnessed with his family was not a re-entering satellite." was unconsciously compelled to write down symbols consisting of lines and squares from left to right, on the back of the Motel 6 full page receipt....It has been independently confirmed both by myself and another researcher (Dr. Horace Drew) that C.J.’s symbols are in fact a message written in binary code that can be translated via a standard ASCII table." C.J. 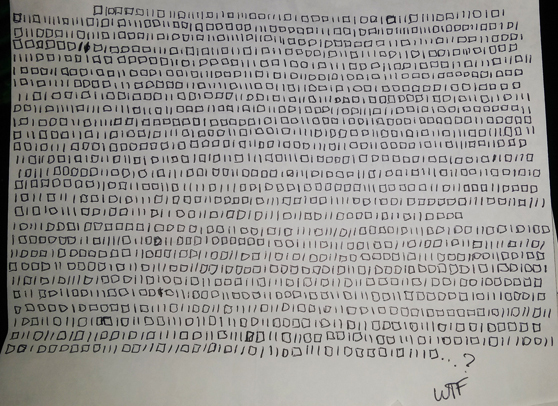 's ASCII Binary Code channeled after his UFO sighting. Where have we seen this before? Oh yes, hundreds of 'insider' comments about Penniston's amazing Rendle-sham notebook, a few postings back. Reports of UFOs can be compared to this list to see if the incident was caused by a satellite falling out of orbit. Of course, if the incident was caused by a brilliant meteor fireball, it will not be on this list.